“Calm down, it’s only cricket…”, said no one ever to a cricket fan, being fully aware of the consequences if they did so. 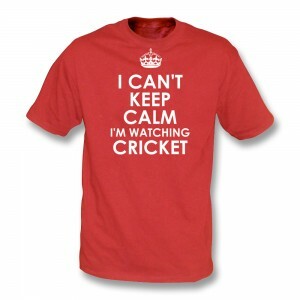 Now, it’s time to prove that point with this new design in store, because I Can’t Keep Calm, I’m Watching Cricket! This hilarious new design is perfect for that ultimate cricket fan – the one who’s glued to the TV all day, up throughout the night for Ashes when it’s in Australia (or vice-versa, for you Aussies reading this)… no matter the game, you’re there – and not missing a single run! Available as a t-shirt, women’s slim fit, hoodie, sweatshirt and in kids sizes, this great design caters to all lovers of the great sport! So don’t wait around – you can find this new design here!